The kits listed below include the beads, the cords & rayon bouclé, clasps, Peyote sleeves and the copyrighted instructions available in a downloadable PDF format. The manual is 14 pages long and contains over 40 pictures making this project easy even if it is your first kumihimo project. It includes instructions on how to set up your cords on the K-Disk, how to load the beads, how to braid, how to braid with beads, how to remove your project from the K-Disk, and how to prepare the ends for the clasp and how to finish the project. It has a what if? section, plus standard bracelet lengths and how to care for the pieces. The cords are pre-cut and bound. They are ready to be inserted in the slots in the kumihimo disk for your convenience. Tool Bags specifically designed for this project are available. 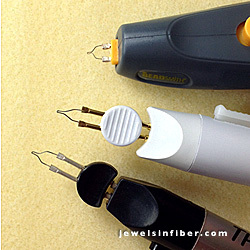 They include: a Mini K-Disk, 8 EZ-Bobs, a Weighted EZ-Bob, a Mini-Clamp, a Big Eye and a Bead Embroidery Needle. If you have all the material and tools on hand, you can purchase the PDF manual by itself. 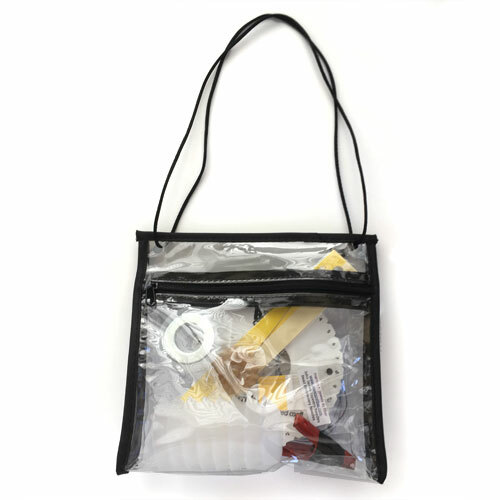 In addition to the materials included in the kits and the Tool Bags, you will need a heavy duty scissors, shear or snips, plus an adhesive to attach the clasp such as Poly Zap Super Glue, Zap Jewelry Gel or Devcon 5-Minute Epoxy. A thread burner is recommended finishing the thread ends of the Peyote Sleeves. This colorway combines greys, gold and rust. It reminded me of Paris, especially Place Vendome with its classical colors. The Rayon Bouclé starts with deep rust, then goes to charcoal, grey, light rust, grey and back to charcoal. 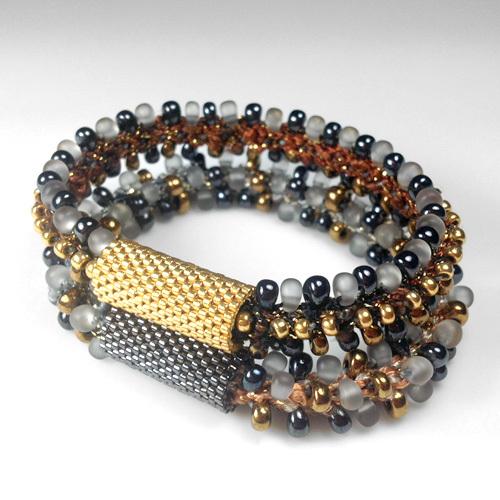 The beads are gold, frosted grey, dark bronze & gunmetal. The peyote sleeves are gold, gunmetal and copper. Makes 2 bracelets with two different bead placements. One has beads on the edges and top only, the other one has beads all around. The cords are pre-cut, bound and ready to braid. 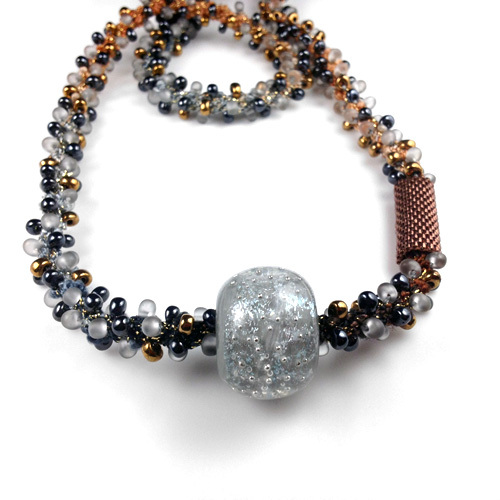 The large focal glass bead can be either slid over the clasp and moved around or added while braiding depending on the actual inside diameter of the bead. These beads are handmade so variations between beads are to be expected. Make 2 necklaces, or 1 long necklace and 1 bracelet - The cords are pre-cut, bound and ready to braid. This colorway combines aqua, rust, purple and grape. It reminded me of the Minoan murals in Crete, then I thought of Santorini, the beautiful island in Greece where Atlantis could have been. 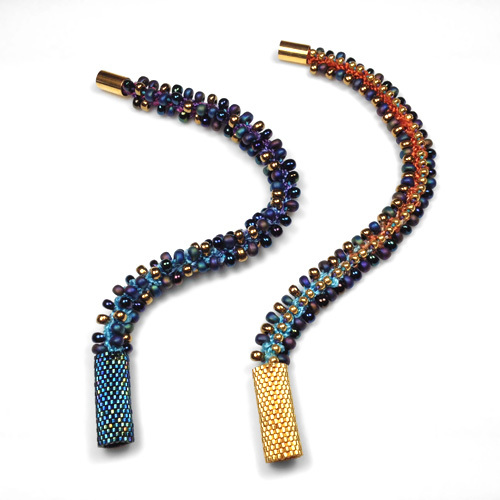 The Rayon Bouclé starts with rust, then goes to aqua, purple, grape, and back to purple and aqua. 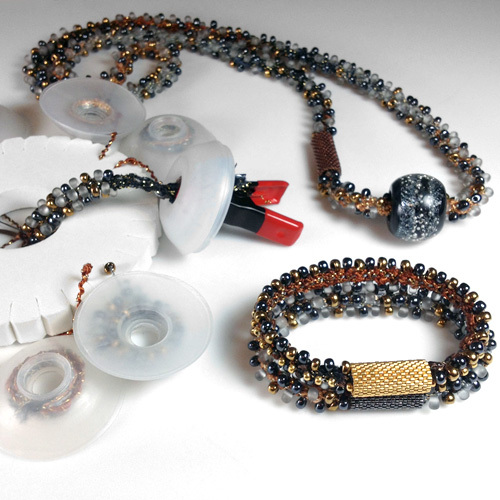 The beads are gold, metallic blue iris, dark bronze & matte black iris. The peyote sleeves are gold, blue and dark plum iris. Make 2 bracelets with two different bead placements One has beads on the edges and top only, the other one has beads all around. The cords are pre-cut, bound, and ready to braid. Picture on the left show the 2 bracelets side by side. Picture on the right shows the front and back of the same bracelet. Color: Black Iris Shown Here was my first choice, but it is no longer made. Black Starburst is the best current choice. New Photo coming soon. and a larger, nicer bag with satin edges. This is a 14 page PDF document with over 40 pictures. This will take you directly to a Paypal checkout payable with any major credit or debit card. Once your payment is complete you will be redirected to a web page with the link to the PDF and the password. Save the password and bookmark the page for future viewing. Please Note: These instructions are copyrighted and are for personal use only. If you would like to use these instructions to teach, either buy a set of instructions per student or get Bead, Cord & Clasp Packs for each student. Do not duplicate this document either in print or in an electronic manner. When purchasing this PDF, it is assumed that you agree with the terms of the copyright of this document. As to bracelets or necklaces, make as many as you wish - it is an original adaptation on a basic kumihimo design. See additional note on copyright below. Thanks for understanding!